Histories of humanitarianism often cite two specific examples of nineteenth century humanitarianism: the latter parts of slave abolition movements and the founding of the Red Cross in Geneva in 1863. Besides these, particularly for the early part of the century, specific examples of humanitarian activities remain rare, with general references to philanthropic as well as social and religious reform movements prevailing. I would like to argue here that this is because humanitarian endeavours in the early Nineteenth Century in Europe and North America developed in local contexts, making it difficult and cumbersome to join the various ʿdotsʾ of humanitarian activities that existed. By linking such ʿdotsʾ – like doing children’s ʿdot to dotʾ drawing, hence the title of this blog post – a more precise picture of early humanitarianism might emerge. This blog post will demonstrate the benefits of such an approach through two concrete examples: the connections between the founding of the Red Cross Movement and an early foreign aid movement 40 years earlier, both in the locality of Geneva. In addition, there are more ‘connected dots’ between the Geneva Greek Committees of the 1820s and the Red Cross Committee many years later. Dufour, for example, can be found advising Eynard in 1826 about sending European soldiers and commanders to Greece to support the fighting (BPU Ms suppl 1885 f. 202, 217, 227). The doctor, Gosse, who went to Greece in the 1820s, reappears as a correspondent of the Red Cross founder, Doctor Appia, in the 1860s (BPU Ms suppl 2662 f. 19-23) and as a fellow delegate of Moynier at a philanthropic conference in Berlin in 1856 (Durand p. 29). Indeed, the 1820s origin of the Geneva “Societé de la Utilité Publique” goes back to the Greek Committee members Sismondi and Dumont (Senarclens p. 13). Finally, in Greek Committee subscription lists, the Moynier and Dunant family names can be found (BPU Ms suppl 1891 f. 90-91), as well as a donation from Dufour himself (ibid. f. 16). Henri Dunant’s father apparently gave a young Greek student a temporary home in his house in 1828 (Bouvier-Bron p. 31), possibly arranged through the Greek Committee. 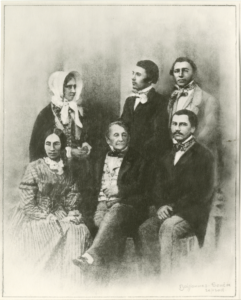 Finally, when comparing the sixteen founding members of the 1860s local Geneva Red Cross Society (Durant p. 18), as opposed to the international committee of five citizens mentioned above, with the 1820s Greek Committees, the family names of Eynard, Hensch, Kunkler and Pictet overlap. Linking these ‘dots’ should not be misunderstood as an attempt to create a narrative arc between these two movements, in the sense of Dunant and his cofounders taking up lessons learnt from the experience of their philhellenic compatriots 40 years earlier. After all, the raison d’être of these movements differ: Greek Committees were concerned with a people obtaining independence, a one-off event, and only some of their activities fall into the realm of humanitarianism. The Red Cross Committee’s key concern was seeking wide and general protection of wounded soldiers in the long-term, and generally represents a purer form of humanitarianism. Nevertheless, drawing connections between the two movements serves to illustrate that the Red Cross movement did not develop in a vacuum, but that it belongs to profound, sometimes very local, traditions of charity, philanthropy and political engagement of citizens, with particular links to protestant evangelical milieus. The founding fathers of the Red Cross could thus draw inspiration from the endeavours, success and prestige of people like Jean-Gabriel Eynard, who combined helping distant sufferers with networking in the highest circles of European society and politics. At the same time, potential ambiguous motives appear: was Dunant inspired by Eynard not only in the sense of practical organisations of networks through correspondence and travels, but also in the sense of aspiring to follow Eynard’s example to obtain the same high social standing in his home town, and to secure a similar financial situation by combining philanthropy with successful banking businesses? To conclude, the lines between the ʿdotsʾ described in this blog post are best represented as thin lines, rather than as thick arrows, which link in with many other ʿdotsʾ. Some of these will not belong on a drawing of exclusively humanitarian activities in a contemporary sense. Finding them may require going down to the level of localities – such as Geneva – and of individual persons – such as Dunant and Eynard – by using personal archives and local libraries. Through such ‘bottom-up’ research endeavours, a multi-dimensional picture of how and where humanitarian activities developed in the early Nineteenth Century may eventually emerge, which will enhance the background understanding of how and where key moments, such as the founding of the Red Cross, happened. – Papiers Louis-André Gosse: Ms fr 2662 Correspondance. – Papiers Henri Dunant : Ms fr 2109 Correspondance 1863-1869; Ms fr 2115 Photocopies et copie dactylo de 4 lettres d’Henri Dunant secrétaire des Unions chrétiennes 1852-1857. – Papiers Collection Eynard: Ms suppl 1885 Correspondance relative à la Grèce; Ms suppl 1891 Papiers concernant les Grecs et la Grèce. – Bouvier-Bron, Michelle ‘Une polémique chez les philhellènes à Genève en 1827. Jean-Guillaume de Lunzi et Frédéric Lullin de Chateauvieux’. La Revue Historique 8 (2011): pp. 7-46. – Kerschbaumer, Florian and Schönhärl, Korinna. ‘Der Wiener Kongress als „Kinderstube“ des Philhellenismus: Das Beispiel des Bankiers Jean-Gabriel Eynard’. In: Vormaerz und Philhellenismus, hrsg von Ann-Rose Meyer (Bielefeld: Aisthesis Verlag, 2012): pp. 99-127. – Klein, Natalie »L’Humanite, le Christianisme, et la Liberte«: Die internationale philhellenische Vereinsbewegung der 1820er Jahre (Mainz: Philip von Zabern, 2000).- Durand, André. ‘Gustav Moynier. A la recherche de sa vocation’. Société Genevoise d’Utilité Publique, 3e series, 12 (1988): pp. 16-33. – Durant, Roger. ‘Henri Dunant: Franc-Maçon? Certainement pas à 99%’. Société Henri Dunant Bulletin 21a (2003): pp. 1-24. Very insightful blog from a brilliant author. I learnt a lot from this article! In a possible follow-up blog I would love learning from Natalie why Geneva in the XIX century became such fertile grounds for humanitarian initiatives. Thank you for your comment and positive feedback! We’ve passed your message on to Natalie, and would totally welcome a follow-up contribution from her on CROSS-files. This is an excellent question, but it is not easy to answer why Geneva may have been a particularly fertile grounds for the development of humanitarian ideas and activities. My first response would go back to the dot-to-dot picture: while there are many “visible dots” for Geneva in the 19th century, including the famous founding of the ICRC itself, there may be lesser known or even not know other locations, with equal accumulations of “dots”, in the picture of how humanitarianism formed, maybe popped up and disappeared again, as a practice at this time. Just to mention that counting each Greek Committee in Europe and the US in the 1820s arrives at a couple of hundred different locations. On a more serious note, it is likely true that Geneva was special in the history of humanitarianism. Drawing on Peter Stamatov’s work on The Origins of Global Humanitarianism. Religion, Empires and Advocacy (Cambridge University Press, Cambridge 2013), religious commitment and religious reform movements can be regarded as key drivers in the development of humanitarian action in the 15-18th century. Here, there is surely a specific link to Geneva! On a more mundane level, levels of prosperity and peace probably also play a role. David Forsythe (The Humanitarians, Cambridge 2005; in turn drawing on work by Francois Bugnion) has spoken about the “exceptionalism of Geneva” (p. 17), citing a group of influences that led to the founding of the ICRC specifically in Geneva. I suspect that, with more local and bottom-up research into the history of humanitarianism, such ideas may be found to have been influential also in other locations, and at other times: belief in the possibility of progress, international outlook, missionary spirit to do good in the world, acceptance of the limitations of government, and a belief in humanitarian dignity. But I would love to hear some other opinions on this great question!